Song of the day: Ai Otsuka – "Smily"
You may have missed this song a little while ago tucked away amongst all the others in my long and rambling fanboy post about this particular individual, so I thought I’d rescue it from obscurity. I’ve been wanting to let you know about J-popper Ai Otsuka for ages, but have been constantly distracted by my quest to fill your ears with Antipodean power pop. Everything about Ai Otsuka is adorable (or unbearable, depending on your perspective). First of all, she’s impossibly cute. And she’s a qualified kindergarten teacher, so, if her music career hits the skids she can follow her non-musical dream and go back to teaching little kiddies (awww). Even her name, “Ai,” means “love” (awwwww). I tell you, Ai Otsuka is so adorable that I’m ready to adopt her at the drop of a hat. By the way, her songs are actually hers (i.e., she writes ’em all). Ms Otsuka doesn’t have a team of songwriters coming up with formulaic pop to appease a tween audience. Ai Otsuka is cute and talented. I won’t pester you with too many of her songs, just enough to give you an idea of why I like her music. If you were looking for anything cuter, I think you’d have to find some photos of kittens cuddling ducklings. Anyway, “Pretty Voice” lets you know straight away that Ai Otsuka is a pop girl who’s full of beans (or, judging by the album cover, full of jelly beans). One thing I love about “Pretty Voice” is the banjo. Yes, there’s a banjo in this song – and it’s hyperactive. How many pop songs, Japanese or otherwise, can you think of that have a hyperactive banjo in it? “Superman” is built around a nice rocky riff and contains some unusual English narration. It’s the kind of English that’s led people to coin the term ‘Engrish‘. I love Engrish (and so does this person) in its innocent mangling of the English language. For example, there could be a greatest hits compilation by an artist but instead of being called something like Greatest Hits or The Best Of…, it’ll be called Super Happy Fun Best Ever. I love that. “Peach” was the theme song to Hanazakari no Kimitachi e (more popularly – and helpfully – known as Hana Kimi), a Japanese comedy/drama TV series in 12 episodes about love found, love lost, and love refound amongst high schoolers. It’s the standard boy-meets-girl scenario, but Japanese-style – which means that as well as the romance there’s also a pile of comedic characters and situations. (I think in the West it’d be called a ‘dramedy’. Ugh.) “Peach” played at the start of each episode and, because I watched – and enjoyed – all 12 episodes of the show with our resident 18-year-old Japanese expert (Hi, Celeste! ), I have “Peach” firmly lodged in my brain. “Pon Pon” is manic. This is a song that you would definitely not want to try singing at your next Karaoke session. A nice little pop song that’s fun, fun, fun. “Ishikawa Osaka Yuukou Jouyaku” (“Ishikawa Osaka Friendship Treaty”) is an enjoyable – or tremendously annoying – singalong. 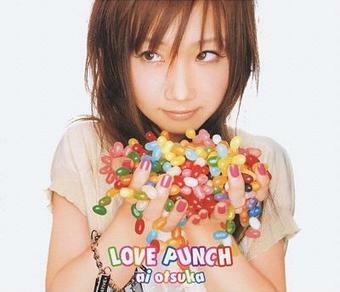 “Amaenbo” (“Spoiled child”) is the penultimate track on Ai Otsuka’s debut album, Love Punch. The melody in the chorus makes me think it could be a ballad version of that album’s opening track “Pretty Voice” (which was Track 01 on this little journey through the Wonderful World Of Ai). Regardless, it’s a nice ballad, and with some lovely falsetto at the 3:01 mark. And there you have it. That was a (very selective) selection of Ai Otsuka songs. I hope you enjoyed at least a bit of some of those songs. Although I have no trouble whatsoever playing (and enjoying) these songs, I understand that there’s a distinct possibility that you’ve turned up your musical nose at the very thought of going anywhere near them. Fair enough. Each to their own and all that. I certainly wouldn’t want to force you to listen to any of it, just I wouldn’t want you to force me to listen to that Venezuelan Death Metal band you like. You are currently browsing the archives for the Ai Otsuka category.